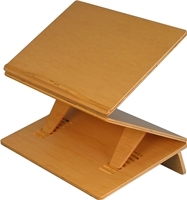 Adjustable Wooden Writing Slope, Large 24"
Transform flat surfaces into an ergonomic desk with an adjustable writing slope that improves posture and enhances comfort. 24"W x 14"D.
Triple-decker wood writing platform raises up to 18 inches from the desk, for standing or seated reading and paperwork. Relieves neck and back strain for office workers, teachers, students, and writers. Adjustable angle for personalized comfort. Heavy-duty leather harness for spinal decompression treatment and exercise. Designed for single or double pull lumbar traction in forces up to 300 pounds in prone, supine, or vertical positions. Transform flat surfaces into an ergonomic desk with an adjustable writing slope that improves posture and enhances comfort. 24"W x 14"D. C-quality factory seconds.